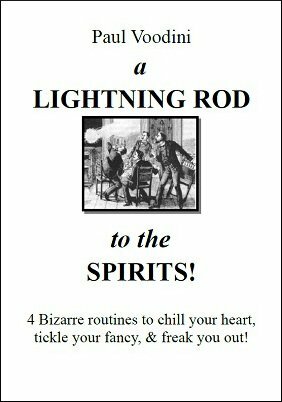 A Lightning Rod to the Spirits contains four exciting new routines, routines that are proud to have their feet planted very firmly in the world of Bizarre Magick! Utilising the most common and simple props (a thumb tip for example and a magic colouring book - not to mention a frying pan! ), these routines will take your audience on a genuinely freaky journey. There are no half measures here - these routines are designed to actually spook an audience! The routines feature at their core common, everyday items such as a watch, a sachet of salt, a child's colouring book and yes, a frying pan. The reasoning behind this is that it is when the mundane and the ordinary become infected with the supernatural that an audience will begin to get genuinely affected by your performance. TIME AT LAST. Traumatic events cause a nurse's watch to house an unhappy spirit. OUT OF THE FRYING PAN. Like a bad joke gone wrong, an unusual murder weapon continues to exhibit homicidal tendencies. DHAMPIRE. After a lifetime in the service of his dark masters, a Dhampire demonstrates just exactly what it is that makes him different from both Human and Vampire. THE COLOURING-IN BOOKS. A proud father finds out that his daughter's newly acquired artistic skills come from a very dark place. Time to call in the local vicar! If spooky magic and the bizarre is your style, you will find much her to interest and excite. All magical elements are practically self-working, allowing the performer to concentrate on presentation and atmosphere. "This. Was. Awesome. Great, simple routines. Great stories. And all ready to perform with the minimum of practice. What more could a Bizarrist ask? As much as I love Paul Voodini's 'ungaffed' work, I would love to see him do more material like this!" 1st edition 2012, 24 pages. I read this and then kind of put it aside for several months. I got a show for an occult bookstore and of course wanted something just a little bit more in that vain than what I have been doing. I did the coloring book with a couple twists (banans flash and restored zigzag paper) it was the hit of the show and was requested two more times. How strange sometimes you never know. my respect for Paul has grown immensely. I will be checking out more of his material. Just finished reading this manuscript. I am a huge fan of Paul's work and this is another excellent example of his creative out put. There are four effects. My favorite is the Nurses Watch followed by the Child Coloring Book. Both in my mind are worth the price of the booklet. The frying pan routine is one that I will put on the shelf for now as it does require a confident and strong presentation. Finally the Vampire Salt routine shows how you can take the simplest trick and make it into a spooky story. This booklet is more of a pathway to get you thinking about all the magical effects that can be re-framed to this genre of performing. Also what you are getting is story for each effect with some performance comments. The secret is reveled but you have to already be familiar with the workings. All basic stuff.